Thoughts on how to invest right now. Yesterday, the stock market tanked, having its worst day in two years. Meanwhile, interest rates are at new record lows. If I can’t put my money in the bank, and I can’t put my money in the share market, where can I put it? I’d be more confident about Australia’s medium-run growth prospects if there was not such strength in the property market. But the risk I see is of a property market correction. That makes me nervous about property. A fall in property prices would crimp consumer spending and hurt the stock market. So I’m nervous about stocks. But the risk of a property correction is just one of the factors that makes me nervous about buying into Australian companies. I’m also worried about China. On anyone’s terms China has had a remarkable run. What happens when that ends? Overall, as an Aussie, we’re very exposed to Australia as it is. Our employment prospects hinge (primarily) on the economy here. Should our investment returns be correlated with our employment prospects? It would seem unwise. So we turn our gaze overseas. Investing globally looks risky, though. America’s S&P 500 is the highest it has ever been. And the ratio of stock prices to stock earnings is about a third above its long term average. The reason people are so into stocks, of course, is the failure of bonds to offer anything approaching a reasonable return. Most countries can take your money for 10 years and reimburse you less than two percent a year -unadjusted for inflation. But investing overseas looks relatively wise. If you think the global economy is normalising, you may be more inclined to bet on the Aussie dollar falling rather than rising. By buying foreign assets now, you gain the chance to get some positive returns in the foreign exchange market. I personally wouldn’t buy Apple shares, because even though they have a lot of cash, I think they’re out of a far more precious commodity – ideas. The Apple watch is a giant distraction from the fact Apple depends almost entirely on the iPhone, a category where people replace their products every few years. 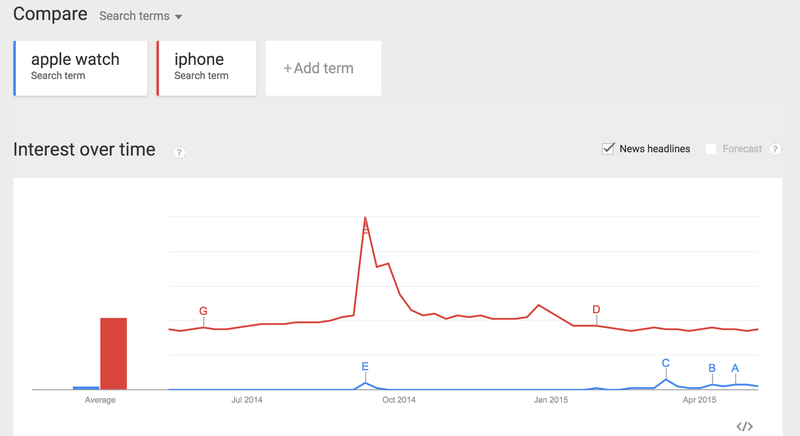 Google trends data – this watch is not the saviour Apple wanted. America is not completely devoid of investment opportunities though. A company that can benefit from a lower oil price might be a good safe buy. Perhaps an airline. Nevertheless, upsides will be limited when buying established companies. Those with appetite for risk might be looking at other options. I’ve been following Bitcoin for a few years, and while I remain skeptical, I think the hype-to-potential ratio is as good as it has been in a long time. Bitcoin’s price has stabilised (well, stable for Bitcoin) in the mid-US$200s. Bitcoin will live and die on its technical usefulness in transactions. I don’t think volatility is the problem. Bitcoin’s price can be unstable across a week or a month, but it won’t matter if people can buy some, transfer funds, and then sell it a few minutes later without accepting too much risk. If there is a constant supply of people wanting to use it for transactions, then demand will be strong. Other people will hold it as a longer-term investment. The more this latter category grows, the fewer Bitcoins will be in circulation for transacting, and the more the price will rise. The key will be simplifying the interface so people can use Bitcoin easily and safely. For that reason recent developments that see infrastructure being developed for transacting in Bitcoin are encouraging. Bitcoin is now legal for transactions in California. An avalanche of new bitcoin transaction apps is hitting the market. And the biggest investment banks are getting involved with the currency. The biggest risk Bitcoin faces is regulatory. Its appeal to organised crime makes it a target for governments, and so it remains an option only for the bolder investor. (I haven’t got any yet, but I am considering doing so. If I do I shall write up my experience). So dear readers, if you want to dispute my assertions, share any stock tips, or provide investment wisdom, please leave a comment below! I don’t think you can “invest” in bitcoin. You can certainly speculate in it, but I would note that exchange rate instability (needed to get a return on your speculation) is ultimately harmful to the future of BTC and therefore only really suitable for short-term speculation. I agree BTC doesn’t make returns, just capital value change. But not sure I follow how forex volatility is bad for bitcoin? As a user of BTC for transactions if there’s a lot of volatility I am taking an unbounded forex risk when all I want to do is buy something. No thanks, I’ll take my bank and a bounded transaction cost. Also, an “investment” strategy that relies on increasing demand for an asset from other investors is pretty much the definition of a Ponzi scheme. A ponzi scheme is where investor/speculator demand is the only demand. Bitcoin is more like property. Some people buying to use it, some people buying in the knowledge other people need to use it. To be fair, buying in anticipation of increasing usefulness/demand but in the absence of dividends is a tried and true investment strategy that keeps a lot of young companies afloat. As to the forex risk, you sound more experienced than I am. But I’d like to think that if the deal is closed swiftly enough on both ends the currency risk is not great. There would also have to be people who’d buy that risk for a small spread (just as a bank does). I imagine all this will develop as bitcoin is better integrated. Previous Previous post: Will India save us from the decline of China? Next Next post: Australia’s small business obsession.